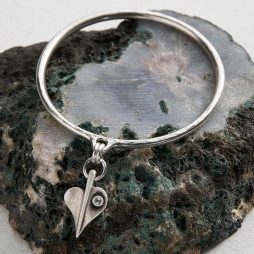 We have the best collection of birthday gift ideas for her here at Lizzielane. 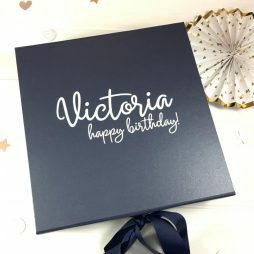 Whether you’re looking for a present for an important special birthday or a unique gift, then look no further than our beautiful birthday gift ideas collection. Some of our favourite gifts include the Joma Jewellery a little ‘Happy Birthday’ silver bracelets and the Katie Loxton ‘Happy Birthday’ Candle. 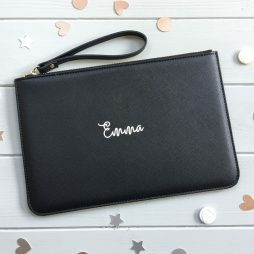 Elegant Personalised Pouch Clutch Bag perfect for any occasion. These beautiful clutch bags are a unidue gift for friends and family. Perfect for taking with you in the evening, organising your essentials inside a larger handbag during the day or simply to hold your phone and make-up essentials. Available in soft pink, white and classic black. Elegant Personalised Pouch Clutch Bag perfect for any occasion. 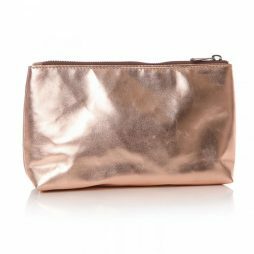 These beautiful clutch bags are perfect for taking with you in the evening, organising your essentials inside a larger handbag during the day or simply to hold your phone and make-up essentials. Available in soft pink, white and classic black. 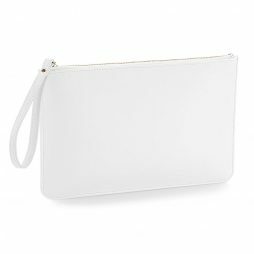 This essential pouch in a soft white is the perfect size to keep your phone, keys & make-up. Ideal for Brides, Bridesmaids, holidays and girls nights out. Made from a beautiful Saffiano grain pu leather with a gold zip and carry handle. 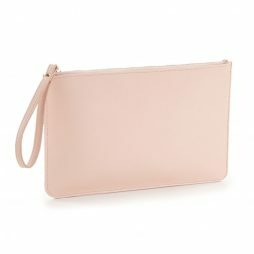 This elegant essential clutch bag/pouch in a soft pink is the perfect size to keep your phone, keys & make-up. 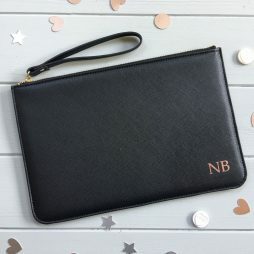 Stylish and chic, our Personalised Monogram Pouch Clutch Bags are available in soft pink, white and classic black, making them the perfect pouch for any occasion. 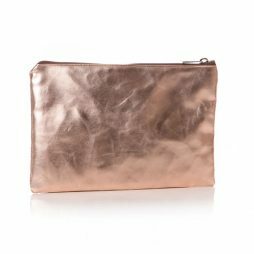 These beautiful clutch bags are perfect for taking with you in the evening, organising your essentials inside a larger handbag during the day or simply used to hold all your phone and makeup. Made from faux leather, with a textured finish, gold metal zip and finished with a wristlet strap. 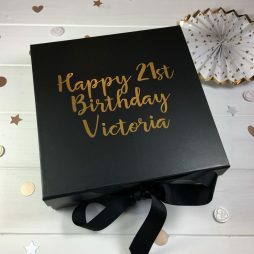 An elegant gift box, ideal for filling with birthday gifts. Not only suitable for milestone birthdays such as; sweet 16, 18th, 21st, 30th, 40th, 50th, 60th but also perfect for any age. 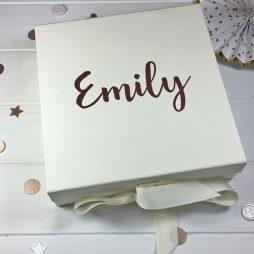 Personalised with the name and age of your choice, there is also the option to include a surprise message inside the box lid, for example: “To Liv, Lots of love, Sam” (+£2). 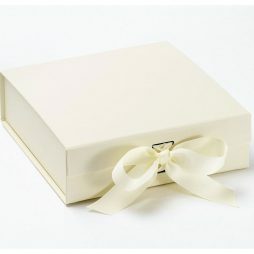 Elegant gift boxes, great for filling with a birthday gift for friends and loved ones. 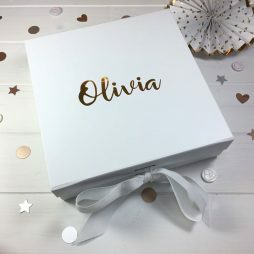 Personalised with the name of your choice, there is also the option to include a surprise message inside the box lid, for example: “To Liv, Lots of love, Sam” (+£2). 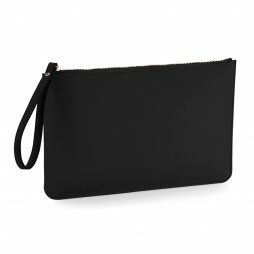 Elegant and chic, our essential Pouch clutch bag in classic black is perfect for taking with you in the evening, organising your essentials inside a larger handbag during the day or to simply keep all your make-up in. Made from faux leather, with a textured saffiano finish, gold metal zip and finished with a wristlet strap. These elegant gift boxes are the perfect way to present your special gifts to loved ones. Ideal for Bridesmaids, Grooms, Best Man, Usher, Maid of Honour, Mother of the Bride, Mother of the Groom, Wedding Keepsakes, Amazing Auntie, Super Sister, Mum, Dad, Best Teacher and Birthdays. 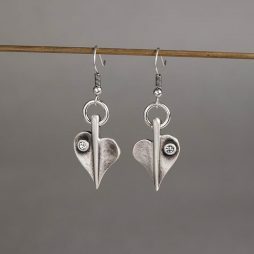 These beautiful silver plated Danon Jewellery’s earrings feature the iconic leaf of love silver charm finished with a brushed effect and set with a sparkling Swarovski crystal, hanging from a small ring, connected to fish hook earrings suitable for pierced ears. 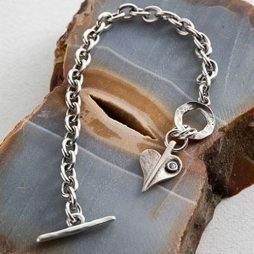 Simple and divine, they make a wonderful and original present for any occasion. A chunky chain bracelet with a touch of sparkle. 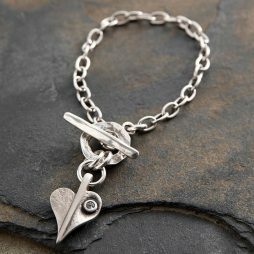 Hand made by Danon Jewellery, this bracelet features Danon’s iconic Leaf of Love Heart charm, set with a single Swarovski crystal and is finished with t-bar fastener. Sparkle and shine, with this hand made bracelet by Danon Jewellery. 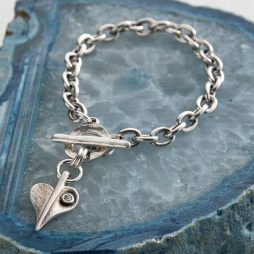 Danon’s iconic Leaf of Love Heart charm is set with a single Swarovski crystal on a dainty chain bracelet with t-bar fastening. 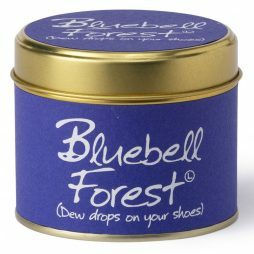 The Lily-Flame Bluebell Forest (Dew drops on your shoes) candle was inspired by a fairy tale-like forest with a carpet of bluebell flowers. Filling your home with a remarkably evocative Bluebell scent, that is soft, fresh and sweet in equal measures. 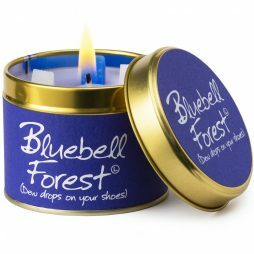 Hand poured into a gold tin and topped with a scattering of wax decorations for an extra hit of fragrance, this candle is finished with a royal blue paper wrap and titled with the words Bluebell Forest (Dew drops on your shoes). 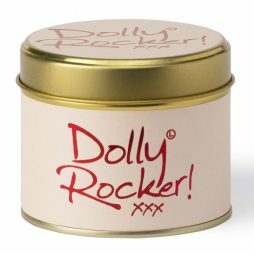 Lily-Flame Blush Scented Gift Candle Tin – The First Kiss of the Night! Fill your home with this sultry, smouldering scent – a unique, precious and beautiful thing. 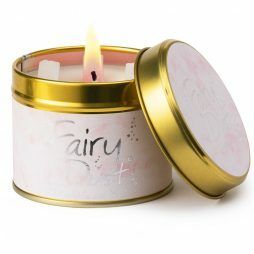 Lily-Flame candles are hand poured into a gold tin and topped with a sprinkle of wax decorations for an extra hit of fragrance, this candle is finished with a blush pink paper wrap and titled with the words Blush! The First Kiss- Of The Night! 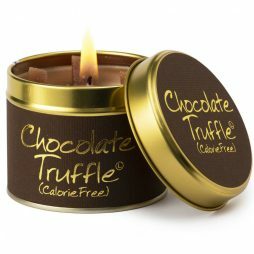 For those of us chocoholics, this yummy frangranced candle fills your space with a super rich, luxurious Belgian chocolate scent. 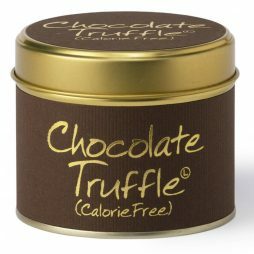 The Chocolate Truffle Candle by Lily-Flame has jsut got to be the next best thing to teh real deal, but without the calories. 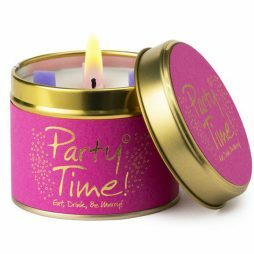 Lily-Flame candles are hand poured into a gold tin and topped with a sprinkle of wax decorations for an extra hit of fragrance, this candle is finished with a mocha paper wrap and titled with the words – Chocolate Truffle (calorie free). 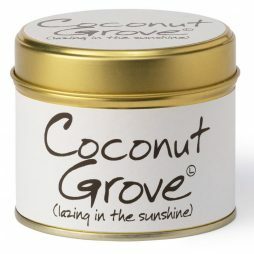 Escape from the stresses of your busy life with the mellow and rich fragrance of Lily-Flame’s Coconut Grove candle. 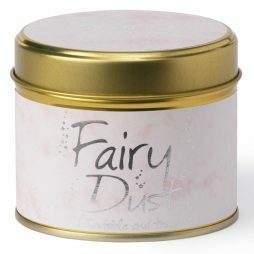 Filled with magic and sparkle, this Fairy Dust Candle by Lily-Flame is their most popular candle. Hip-hip, hooray! 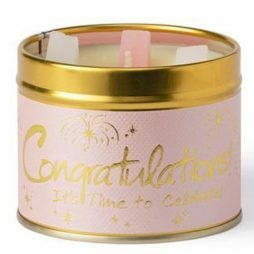 It’s time to celebrate, and what better way to say ‘ Congratulations’ than with this Lily-Flame candle. Vibrant, sparkling and sophisticated, this perfume blend is the perfect token gift whatever the occasion. 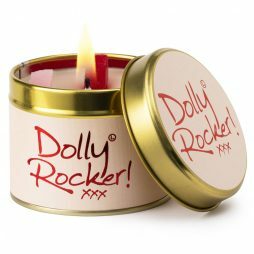 From the song Dolly Rocker ( an vintage style of dress) , this candle from Lily-Flame fills the home with a beautiful, powdery, girly scent. 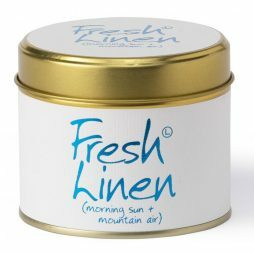 Evoking a feeling of warm morning sun and fresh mountain air, this Fresh Linen candle is super fresh and breezy. Hand poured into a gold tin and topped with a scattering of wax decorations for an extra hit of fragrance, this candle is finished with a white embossed linen pattern, paper wrap and titled with the words ‘Fresh Linen’ (morning sun + mountain air). This Good Luck! 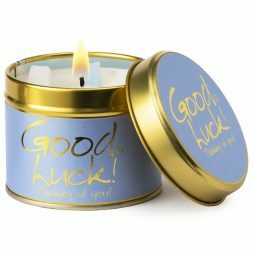 Thinking of You candle from Lily-Flame is the perfect little gift to say Good Luck and is sure to fill your home with a mellow and uplifting floral scent to keep you calm and lift the Spirits! The perfect little Birthday gift, Happy Birthday!.. And Many Happy Returns! 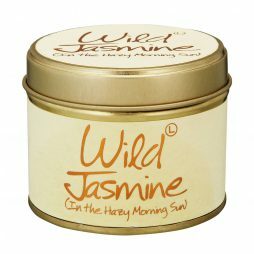 candle fills the home with a bubbly, gentle, sweet scent that’s impossible not to love. 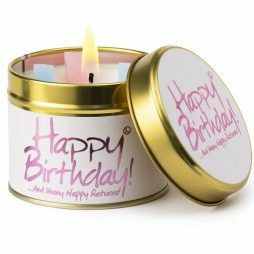 Hand poured into a gold tin and topped with a scattering of wax decorations for an extra hit of fragrance, this candle is finished with a white and pink paper wrap and titled with the words ‘Happy Birthday ‘. Evoking memories of summer, the Rhubarb (and of course custard!) 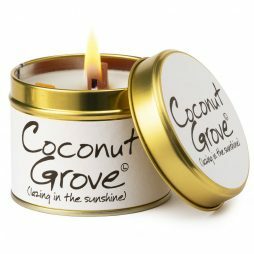 candle by Lily-Flame will fill your home with fresh crisp notes of Rhubarb, complemented by the smooth sweetness of a creamy custard. 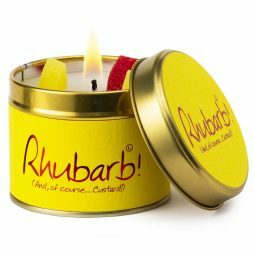 Hand poured into a gold tin and topped with a scattering of wax decorations for an extra hit of fragrance, this candle is finished with a yellow paper wrap titled ‘Rhubarb’ . Filled your home with the fragrance of Spring fields during Harvest Time. 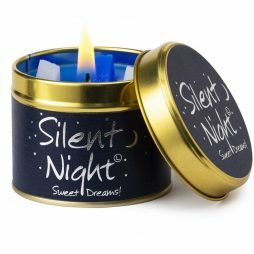 This Silent Night Candle from Lily-Flame is sure to send you into a sweet dream. 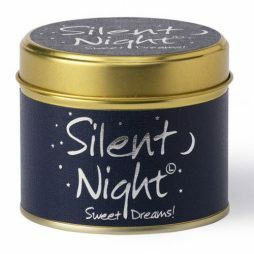 Hand poured into a gold tin and topped with a scattering of wax decorations for an extra hit of fragrance, this candle is finished with a navy blue paper wrap titled ‘Silent Night’ . 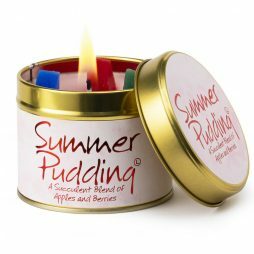 Inspired by the quintessentially British Summer Pudding, this Lily-Flame candle is packed with the scent of juicy summer berries. 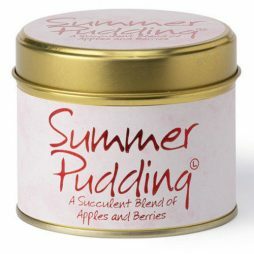 The Summer Pudding candle has an emphasis on sweet strawberries and rosy red apples. 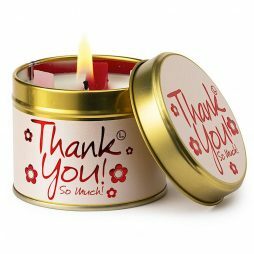 What better way to Thank You, than with this Thank You So Much Scented Candle Tin from Britain’s best loved candle makers, Lily-Flame. 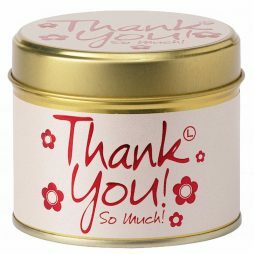 The Thank You fragrance is subtle and powdery, with Amber, Tonka and Vanilla, base notes, Jasmin, Patchouli, Clary sage and Orange Blossom middle notes, and top notes of Lemon, Anise and Spice – it’s longer lasting than a bouquet of flowers and fewer calories than a box of chocolates! 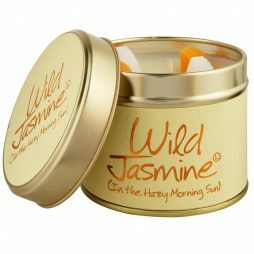 Britain’s best loved candle makers, Lily-Flame have created this wonderful Wild Jasmine – In the Hazy Morning Sun candle. One of our most popular scents, this naturally intoxicating scent is reminiscent of a stroll through the winding streets of a quaint little Mediterranean Old Town. 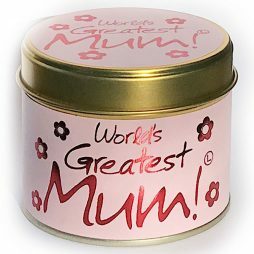 Hand poured into a gold tin and topped with a scattering of wax decorations for an extra hit of fragrance, this candle is finished with a pink paper wrap titled ‘World’s Greatest Mum’. 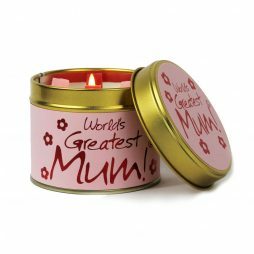 From Britain’s best loved candle maker Lily-Flame, this World’s Greatest Mum Candle is brimming with the sumptuous scent of, fizz, sweet and floral scent and accompanies a pink paper wrap, decorated with a a flower designs – sure to bring a smile to your Mums face. This beautiful new jewellery roll from TaDa range by Shruti Designs is the perfect way to keep all of your jewellery safe and organised. Each roll has a velour outside and a silky inside and is finished with a wrap around jewelled tie. When open there is a large pouch pocket, a poppered strap, and a zip section. 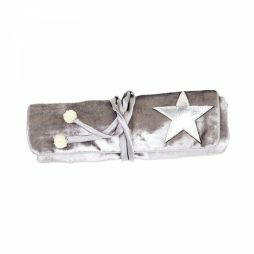 In light grey with a silver star and silver glitzy ball ends. Shruti Designs Beige Ta Da Lips Tote Bag with Gold Detail. When you see this bag you’ll know you just have to have it! 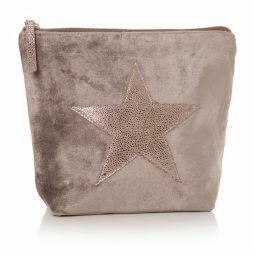 In a go-with-everything beige, faux suede feel fabric this large bag features a shoulder strap and glittery gold coloured lips motif on one side with a metallic style to the reverse. 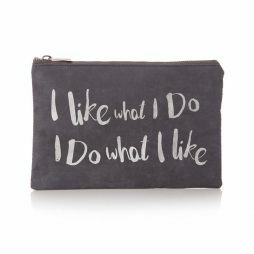 The bag is fully lined inside with ‘ I do what I like ‘ printed fabric, it has two internal slip pockets to one side. By English Designer Lisa Buckridge, this bag is a real show stopper. 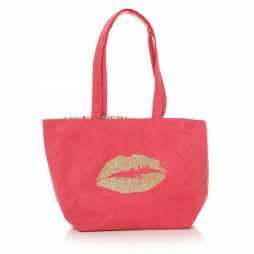 Shruti Designs Ta Da | Pink Lips Tote Bag with Gold Detail. 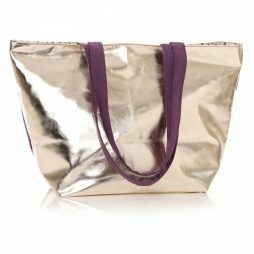 This go-to, faux suede feel fabric tote/beach/shopper bag features a shoulder strap and glittery gold coloured lips motif on one side with a metallic style to the reverse. The bag is fully lined inside with ‘ I do what I like ‘ printed fabric, it has two internal slip pockets to one side. By English Designer Lisa Buckridge, this bag is a must buy this season. 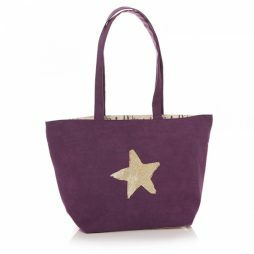 Shruti Designs Purple Ta Da Star Tote Bag with Gold Detail. 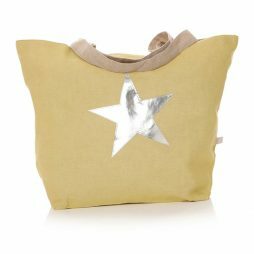 This go-to, faux suede feel fabric tote/beach/shopper bag features a shoulder strap and glittery gold coloured star motif on one side with a metallic style to the reverse. The bag is fully lined inside with ‘ I do what I like ‘ printed fabric, it has two internal slip pockets to one side. 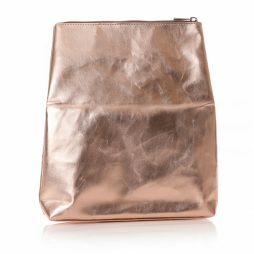 By English Designer Lisa Buckridge, this bag has to be a must have this season. 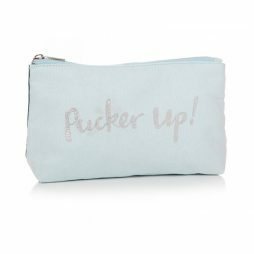 This lovely cosmetic, wash bag with zip, is big enough to hold all your essential items, as well as of those that you just don’t what to leave behind when you go on holiday or away for the weekend. 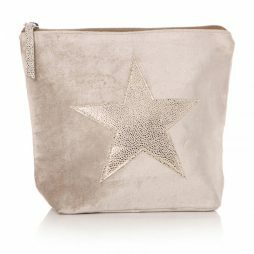 Beautifully crafted in beige valentina with a large copper fabric star design on the front. 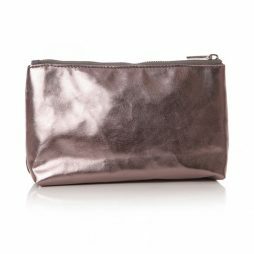 This stylish cosmetic, wash bag with zip, is big enough to hold all your essential items, as well as of those that you just don’t what to leave behind when you go on holiday or away for the weekend. Beautifully crafted in cream valentina with a large gold fabric star design on the front. This set of four, glamourous pink prosecco glass coasters from Shruti Designs are the perfect gift for any home. 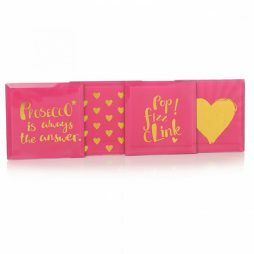 Four Different Desgins; 2 with hearts and 2 with slogans with gold detail, these coasters are presented in a matching pink gift box. Georgous beige with gold colour combination on this Shruti clutch bag. 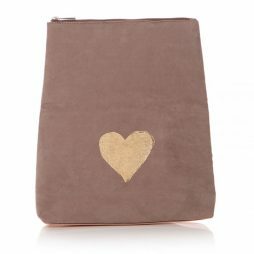 The top of the bag folds over to create the clutch and is crafted in a soft beige suedette and metallic gold with heart design, this pouch is full lined on the inside with zip fastener. 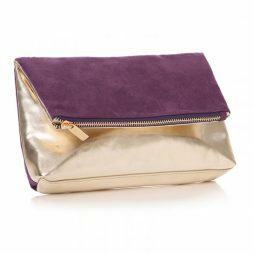 We love the purple and gold colour combination on this Shruti clutch bag. 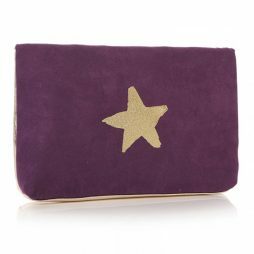 The top of the bag folds over to create the clutch and is crafted in a soft purple suedette and metallic gold with star design, this pouch is full lined on the inside with zip fastener. 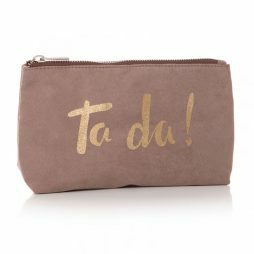 This must have cosmetic / wash bag from Shruti Designs is crafted from a soft beige suedette with the words ‘Ta Da’ written on the front in gold letters. Fully lined with ‘I do what I like’ fabric print and finished with a silver zip top fastener. Perfect for all your make-up essentials. 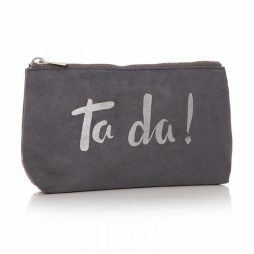 Essential cosmetic / wash bag by Shruti Designs, crafted from a soft grey suedette on the front with the words ‘Ta Da’ written on the front in silver. Fully lined with ‘I do what I like’ fabric print and finished with a silver zip top fastener. Perfect for all your make-up essentials. 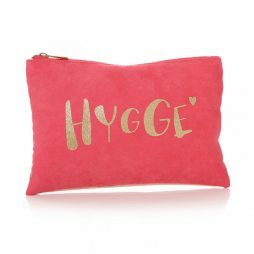 This beautiful pouch in a pink suedette has the word ‘Hygge’ written on the front in gold. Fully lined with ‘I do what I like’ fabric print and finished with a zip top fastener. Hygge is Danish word meaning, a mood of coziness and comfortable conviviality with feelings of wellness and contentment. This fabulous pouch is the perfect gift. 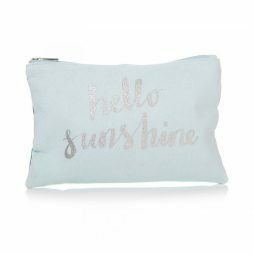 Crafted in a teal suedette with the words ‘Hello Sunshine’ in silver on the front. Fully lined with ‘I do what I like’ fabric print and finished with a silver zip top fastener. I like what I do, I do what I like. 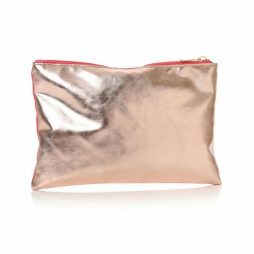 This lovely pouch with silver zip is the perfect little gift for friends and loved ones. 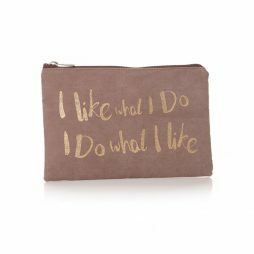 Crafted in a soft beige suedette with the words ‘I like what I do, I do what I like’ in gold on the front and fully lined on the inside with ‘I do what I like’ fabric print. Just what every girl wants. 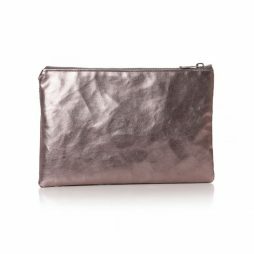 This beautiful pouch with silver zip is the perfect gift for your loved ones this season. Crafted in a grey suedette with the words ‘I like what I do, I do what I like’ in silver on the front and fully lined on the inside with ‘I do what I like’ fabric print. What more can a girl need? These fabulous, canvas bags from Shruti’s Star Burst Collection are made from a cotton and linen mix, complete with cross-body shoulder strap, zip close and front zipped compartment as well as an internal zipped pocket and phone pocket. This bag features a sequin star design on the front with Shruti tag. Both stylish and practical this bag, perfect for all your essentials in. 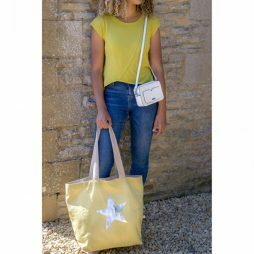 These georgous, canvas shopper bags from Shruti’s Star Burst Collection are crafted from a cotton and linen mix with 2 shoulder straps, matching lining and popper close. 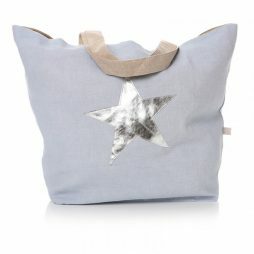 In a beautiful cotton blue, this large tote bag features a shiny silver star on the front with Shruti tag. 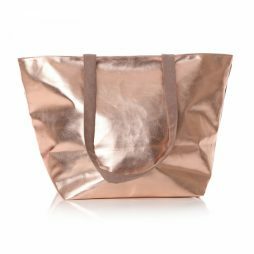 Both stylish and partical this bag is perfect for throwing all your essentials when you hit the beach and the shops. These georgous, light weight canvas shopper bags from Shruti’s Star Burst Collection are beautifully crafted in a cotton and linen mix with 2 shoulder straps, matching lining and popper close. 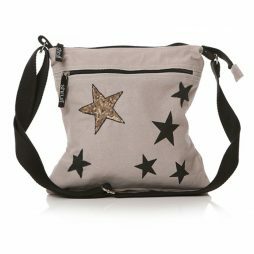 In a fabulous khaki colour, this bag features a shiny silver star on the front with Shruti tag. 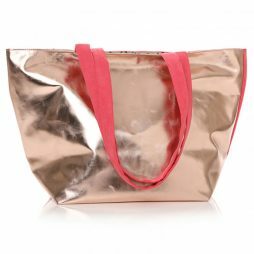 Both stylish and partical this large tote bag is perfect for popping all your essentials when you hit the beach or the shops!